Middlebury is a company that has created online coursework that immerses the student in the language being learned. This is accomplished through a course that is rich in audio, video, and aural opportunities. At this level, there is very little written instruction and when it is, it is to accompany the audio giving the instruction. Everything within the lessons are structured to be highly immersive, allowing the student to experience the richness of the language. These topics are taught through native folk stories, myths, legends, songs, and more. This not only teaches the vocabulary but it stresses the way the language is used and many points of cultural importance. Middlebury has made some very nice changes in the navigation of the site since we first reviewed with them and this time around has by far been the easiest for navigation. My favorite change is that there is a way to navigate to the next lesson with a single click after login. You can either click “Continue My Course” and it will take you to the next lesson for you to complete. Or if you want to jump to the lesson scheduled for that day, you click on “Scheduled For Today.” If you are right on schedule, the two options look the same. As you can see here, Miss J is not. Middlebury schedules a lesson every weekday. We have not been keeping up with that, though it is our goal. The Table of Contents will take you to the lessons and you can then find the lesson you are looking for. Completed lessons have a check mark over them. You can also navigate to the Grade Book from this point. The Grade Book has some really nice features. Remember this is the Grade Book for the course option with no teacher assistance from Middlebury. Much of the course is self-grading and you see those grades appear here. This is a shot of what the grade book looks like when you are looking at the view with tests and quizzes. You can also click a box to get a Course Grade. Easy and simple if you need to keep grades. As you can see, there is a picture listing of the pieces of the lesson on the left. The completed ones have a check mark on them. There is a box to click at the bottom of that column to move to the next lesson. The activity is on the right. This particular activity was a Speaking Test on numbers. She had to click the record button and record herself saying the correct number in Spanish. She then listened to herself to check and make sure what she said was right. She them clicked on the circle in the upper right and it submitted the answers. Since this is not teacher assisted from Middlebury, the fact that she recorded for each of the activities is what it is grading, not whether or not she answered correctly or pronounced correctly. The activities vary widely but each of them are engaging. 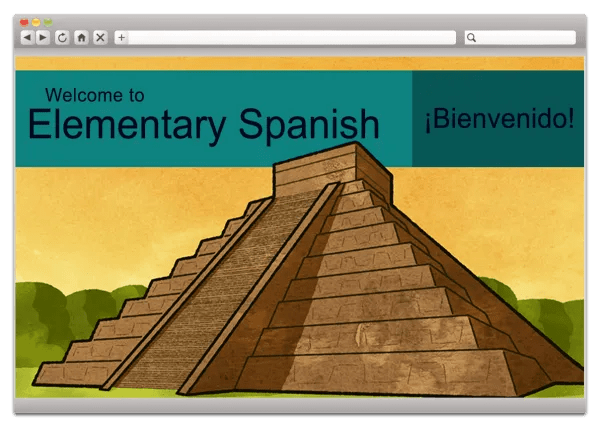 There are stories (told entirely in Spanish), exploring the page to learn new vocabulary, coloring pages (click to color), click and drag to match, speaking labs, songs, and videos to explain cultural traditions and activities. There are most certainly other activities that I didn’t list here. It is definitely a varied approach that immerses the student directly in the language. This immersion is a large part of what I like so much about Middlebury Interactive Languages. The student is told stories completely in the language. The songs are completely in the language. The student has to speak in the language. The vocabulary words are in the language. So much is done in the language that the student learns a lot through the exposure. We are thrilled to be studying Elementary Spanish 1 (Grades 3-5) this year. The experience is enjoyable and much learning is going on. You know it is working when Miss J is playing outside and singing a song from her Spanish Course. It made me smile to see the way the language has become part of her. The Homeschool Review Crew had families working with no only the Spanish Courses but also the French Courses, the German Courses, and the Chinese Courses. Click the banner below to read about their experiences. you have an external mike on your computer… I wonder if that would help us? hmm…. It is one of those that is actually a camera but has a mike on it. Works good.